Anya Richkind doesn’t dive too deep in this coming-of-age story that gets gory. Jordan G. Teicher reviews. The mermaids in Anya Richkind’s play shimmer and smile, they dance and they dream. But make no mistake: The End of Mermaids, part of the Corkscrew Theater Festival, is no blissful fairy tale. Nobody lives happily ever after. It doesn’t seem that way at first. When we initially meet Mermaid Bee (Maggie Thompson), Mermaid Vana (Lindsey Spohler) and bright-eyed newcomer Marie (Isabella Dawis)—performers at a struggling Florida attraction called Mermaidland— audiences might think they’re in for a fairly conventional coming-of-age story in an unconventional setting. In a series of short scenes, Marie, a transplant from Brooklyn, gets her tail, eats some alligator jerky, learns an underwater dance routine, and discovers a bit—but not enough, unfortunately—about her two co-workers and her manager, Lola (Elizabeth Evans). Bee and Vana, like Marie, are true Mermaidland believers: They simply love being mermaids. And yet, they have their dreams. Bee would like to go back to college and eventually become a political science professor. Vana wants to open a restaurant. As for Marie, it’s not really clear why she’s come to Mermaidland. Faced with the question in a one-on-one meeting with Lola, Marie’s answer is nebulous: She yearns to embody the kind of effortless grace of the mermaids she’s seen on YouTube. That kind of response is typical of The End of Mermaids, which struggles, on the whole, to find its raison d’être. Who, audiences might wonder, are these characters? How did they get to where they are? And what do they want now? While each characters comes with the semblance of a backstory, the answers to these fundamental questions are mostly elusive. Our attachment to the characters, therefore, is tenuous. The plot, meanwhile, moves along swimmingly though largely uneventfully for about half the play. Marie likes her co-workers, they like her, and she picks up the mermaid stuff rather easily. Everything seems fine. And then, eventually, things get weird. How weird? I won’t give too much away, but suffice it to say that the surreal turn of events involves a semi-sentient alligator (Patrick Reilly) and some bloodshed. It all happens rather quickly, and what starts off as a good-hearted tale about a quirky community transforms into a dark and rather bleak story of greed and violence. Along the way, the focus of the narrative moves away from Marie to Lola and finally to Bee. It also shifts rather abruptly from realism to absurdism and back again to realism, a disorienting experience for audiences. What the play lacks in character development and narrative coherence, however, it makes up for with occasional spurts of irreverent dialogue. Richkind has a knack for dry humor and under Allison Benko’s direction the cast makes her best moments sing. Costume designer Grace Oberhofer, meanwhile, assembles sparkling ensembles that mirror the hokey get-ups of performers at Weeki Wachee Springs, the real-life Florida destination upon which Mermaidland is based. 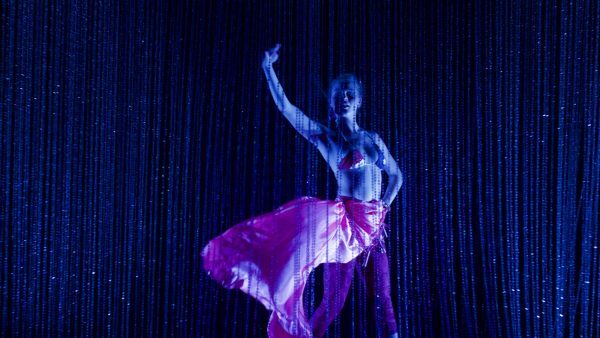 Set designer An-Lin Dauber cleverly uses two rows of beads to evoke the mermaid pool, while Cha See completes the effect with some smart lighting effects. The underwater dance scenes achieve their intended magical effect. For Mermaidland’s most devoted employees, those dances aren’t simply mindless entertainment—they’re important because they deliver something beautiful to the world. In The End of Mermaids, Richkind has fun exposing the falseness and the ugliness behind the beauty—but she doesn’t go far enough to show what that uncomfortable truth means for her characters, and therefore for her audiences. The Corkscrew Theater Festival runs to August 5, 2018. More info can be found here.